Now that’s a good-looking suit. Founded in 1977 and housed on Levels 5 & 6 of the TD Garden, The Sports Museum features a half-mile of exhibits celebrating the history and character of Boston sports. Through its educational programs Boston vs. Bullies (www.bostonvsbullies.org) and Stand Strong, The Sports Museum leads the way in using the power of sports to help kids build character and prevent and stop bullying. All told, more than 25,000 upper elementary and middle school students each year experience a character building Sports Museum educational program. Delaware North Companies, Inc. – Boston (the company that owns the TD Garden and the Boston Bruins) provides The Sports Museum with office space, exhibit space, and management support. The presenting sponsor of The Sports Museum is New Balance Athletics, Inc.
And this was from earlier this year, mind you. Do yourself an entertaining favor and just google his “Coach’s Corner” broadcasts for Hockey Night in Canada with Ron McLean, in particular the older ones. You’ll BEAR witness to one of the most colorful, kooky, critical and at times uncensored personalities the game has ever known (which is old news for many spoked-B followers who are in their 40’s and above but required viewing for anyone within and around the millennial age bracket). I’ve never been able to look at any of my Aunts in the same way ever again. If this sentence and sentiment doesn’t make sense… please take the time to watch the above clip from :25 seconds to :30 seconds (or skip it if you don’t want to be offended, which in this day & age seems to happen no matter what someone says so just watch it and laugh already will ya). What’s no laughing matter (perhaps, outside of his suits)? The legacy that Cherry has left behind for the entire Bruins organization and fan base, like him or hate him. He led the B’s to four straight Adams Division titles (as it was called back in the 70’s, named for the founder of the Boston Bruins, in fact, Charles Francis Adams), two Stanley Cup Finals (it should’ve been three, I know), and a Jack Adams Award as the NHL’s “Coach of the Year” in 1976. Which is why, among many other coaching & commentating accomplishments, Cherry was the hockey man of the hour at The Tradition gala in Boston this holiday season — and no doubt the center of attention after being introduced by one of his “Big Bad Bruins” Terry O’Reilly. You didn’t need to be a professional or aficionado of the game to appreciate what a special night this must have been for all involved. And as Kevin Paul Dupont of the Boston Globe recently wrote of Cherry, he was indeed “an original behind the Bruins’ bench” and will continue to be on broadcast airways across Canada (and occasionally the United States) for years to come. Congratulations, Coach! Talk about an evening & event of stars… with a CHERRY on top!!! Welcome Back To Boston: Best Bruins Reunions! Unlike Ralphie from A Christmas Story who nearly shoots his eye out, Ralph Weiland could shoot the puck past any goalie back in his heyday. Pictured in my post from the Fourth (Line) of July, “Cooney” as he was called, was a Cup Champ for the B’s three times — first as a rookie in 1929 then again in his farewell season of 1939 and then behind the bench as a coach in 1941. In “B”tween his Beantown years, he briefly played for the (original) Ottawa Senators and Detroit Red Wings. But it was his triumphant return to the franchise in 1935 after having left just a few years previous that the city of Boston will forever be grateful for. And not just because of the Stanley successes he led the Bruins to Captain Cooney also had a lasting impact at Harvard University where he coached the Crimson for two-plus decades post his memorable career wearing the Black N’ Gold (if you brush up on your French, you’ll understand why thanks to Hockey Canada below). Welcome Back, Cooney! Move over John Jacob Jingleheimer Schmidt… there’s a new best long name in town: Ferdinand Charles Carl Flaman! And believe me, Bruins fans, whenever he did go out on the ice, the people always did shout his name. But they used “Fernie” since it was easier to say and more alliterative. When did they say it? For a nice chunk of time first in the forties then again in the late fifties. Sandwiched in the middle of those two Bruins stints was some Toronto time for Fernie, but any former Hub teammate or current North Shore grandparent will tell you that it was in Boston where the tough-as-nails D-man played his best hockey, racking up accolades & respect just as quickly as penalty minutes (he led the league in PIMs in ’54-’55). Also a team captain like the aforementioned “Cooney,” Fernie (man, those are some great B’s nicknames, don’t you think!?) made the most of his return to the city and region, not only serving as a player-coach-GM for the AHL’s Providence Reds** but later as the head hockey coach of Northeastern. Welcome Back, Fernie! 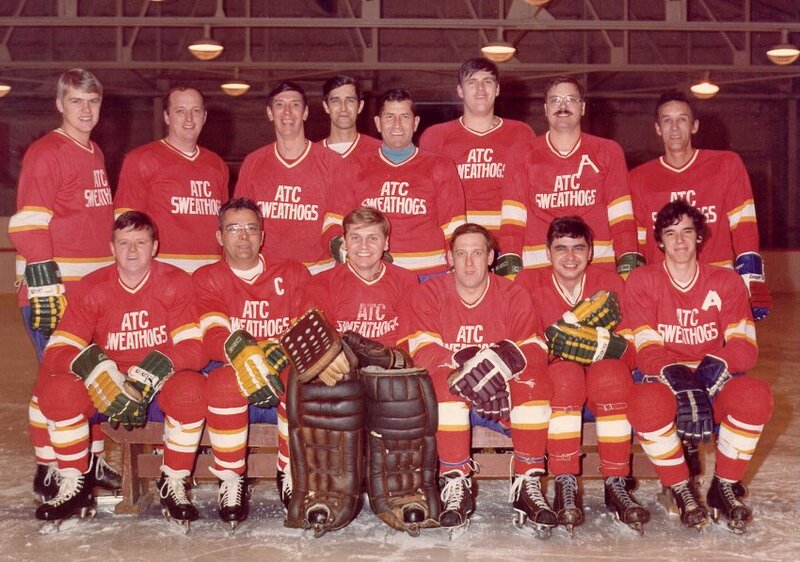 **Read more about the history of hockey in Providence thanks to fellow blogger @hockeygirl2976 by clicking the link! 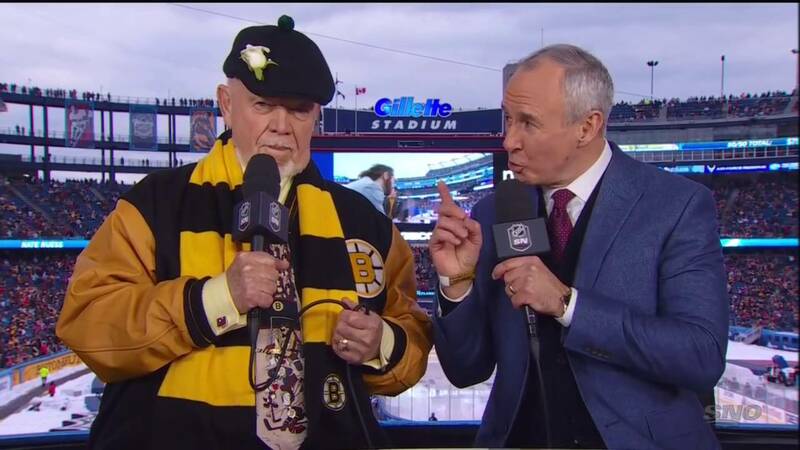 So his NHL playing career only lasted one Bruins playoff game in 1955, but I’ll be damned if Don Cherry didn’t make my list! Flamboyant, eccentric, maddening, colorful (and I haven’t even got to his suits yet), Cherry was — and still is — one of the most singular and original personalities in and of the game. There’s losing. Then there’s Don Cherry losing. But because we’re still talking about it (and did I mention those impeccable suits?) all these years later, I guess he’s somewhat winning. Ah, who am I kidding, any guy who when asked a question about the Bruins responds with “I love them so much I still wear their shorts” (thank you Windsor Star for this quotable gem) is as perfect as a summertime hot fudge sundae with whipped cream. And a Cherry on top. Welcome Back, Coach! Let’s just clear the air, and the ice, right out of the gate and say that perhaps if this soon-to-be-mentioned gallant goalie was in net during the above “Too Many Men” incident, Bruins history would be a lot different (sorry Gilles Gilbert, I’ve always had an affinity for the other G-man between the pipes). And that’s Gerry Cheevers, whom I histrionically mentioned in my first ever post here at Black N’ Gold Hockey. Cheevers, who practically pioneered the art form of “the flop” and always acted as the “third defenseman” of the game, became the B’s number one goalie in 1967 and kept that post-to-post post up until 1972, where after winning his second Stanley Cup in three years, he bolted from the B’s to the fledgling World Hockey Association (WHA). He tended net for the Cleveland Crusaders for four seasons before bouncing back to Boston to finish out his impressive playing career (the only thing more impressive than his Bruins stats during both of these stretches was his inimitable mask as seen below–it’ll literally and figuratively leave you in stitches). There’s just something about guys on the Bruins whose names start with “B” that I like. It feels like they were meant to play in Boston. And twice for this blog’s point! Let’s keep the good goalie vibes going by first featuring Billy Ranford, who impressed the B’s brass so much as a rookie in 1985 that he became what looked like Boston’s “goalie of the future” for 1986 and beyond. That is until a coaching change led to a change of scenery for Ranford in 1988–him being shipped to the Edmonton Oilers along with the plucky (and pucky) Geoff Courtnall for none other than the great Andy Moog. This trade is one I still to this day hem-and-haw about because I love Andy Moog (and tweet at him often because of my vintage NHL75 jersey) and know how amazing he was with Reggie Lemelin as a ‘tender tandem! But I also know that Moog’s Bruins lost to Ranford’s Oilers twice in the Cup finals in ’88 and ’90, respectively. So who knows if a Ranford-in-Boston dynasty could have started if that trade never happened? Fittingly, another trade did happen, and good ole Billy boy found himself back in Boston for the mid-90’s but only for a few seasons. He then became a part of the infamous package to the Capitals that sent out Adam Oates & Rick Tocchet and brought in Jason Allison, Anson Carter and “The Net Detective” himself Jim Carey. While I do miss old-fashioned hockey trades like the ones described, one of BNG’s newest writers, @pastagrl88, has some more historical happenings to look at here if you’re into reminiscing and ruminating about what might have been for the B’s! I’ve always enjoyed Beers’ insight into the game, knowledge of the game and passion for the game — all intangibles he brings to the booth as a former player who doubly appreciated his time in both Boston & Providence. Cheers to Beers and, of course, Welcome Back, Bob & Billy! I truly think Murray could have led the Bruins to a Cup during the early 2000’s if not for then-GM Mike O’Connell and team owner Jeremy Jacobs making some bonehead moves with free agency, the lockout, and trades. Nevertheless, it was still a fun time to watch and root for the B’s thanks to gleeful Glen. Welcome Back, Mr. Murray! Who remembers the highest scoring Polish player in NHL history? Well, our friends at Stanley Cup of Chowder do — Mariusz Czerkawski! He played for the B’s from 1993-’96 then again for a hot second during the 2006 season. How about Mass. native Shawn McEachern who toured the Boston ice in ’95-’96 and returned for a blink-and-you-missed-it cameo in ’05-’06. And who can forget Dobby! That’s right, Anton Khudobin first crammed the crease between 2011-’13 before holding the frozen fort as a back-up these past 3 seasons. Well, if you’ve been a Bruins fan all your life like myself, then the names have all changed since you hung around. But those Cup-clinching dreams have remained, and they’ve turned around. And just in time for the season to soon start. So let’s all be on the lookout for other potential Bruins reunions that could happen in the near future. I mean, who’d have thought it would lead ya, back here where we need ya Milan Lucic, Tyler Seguin, or Jumbo Joe? That probably isn’t true and won’t happen. But it may workout if the right player wants a warm “Welcome Back” to Boston.